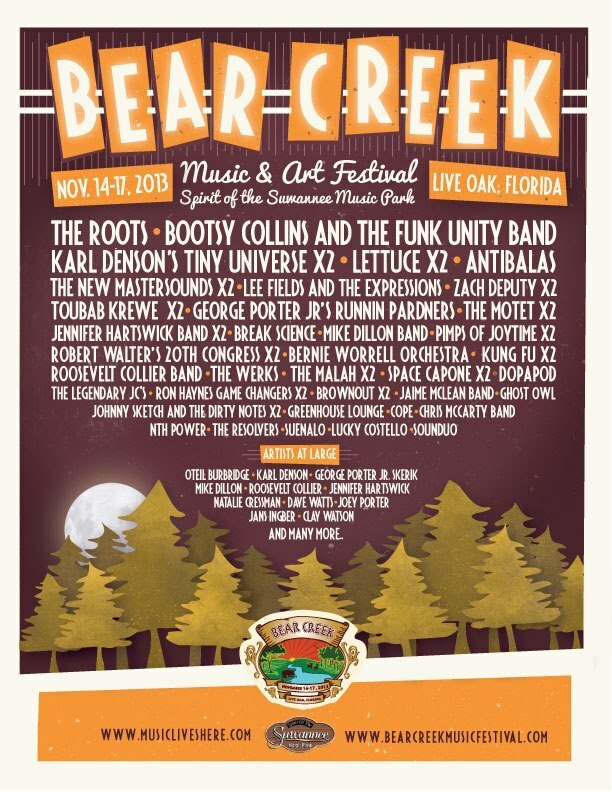 The Bear Creek Music & Arts Festival just unveiled their initial lineup for the 2013 edition live on the air on the world’s greatest radio station WWOZ New Orleans and on their facebook page. The initial announcement, as to be expected, is pretty damn funky and the inclusion of the world famous and Legendary Roots Crew at the top alongside Bootsy Collins goes a long way towards piqueing our interest. Other notable names on the bill include Ghost Owl, the new PGroove off-shoot, and the legendary trio of acts including Bernie Worrell Orchestra, George Porter Jr. and the Runnin’ Pardners and Lee Fields and the Expressions. This year’s festival goes down November 14-17 at the Spirit of the Suwannee Music Park in Live Oak, FL. You can visit the Fest’s website here.